Arrival at Barcelona Airport and transfer to the hotel with your rep. Accommodation. Activities depend on the flight arrival time. If the flight arrives before noon and the customer reaches the hotel at about 3:00 pm they will be given the opportunity to discover the City of Barcelona, known in Spain as the Ciudad Condal (City of the Count), through the sense of taste, going on a Gourmet Walking tour through one of the city's most spectacular neighbourhoods "Barrio Gótico" with a tasting of typical products. Accommodation. Breakfast in the hotel. Depart for Colomers at the agreed time for a great adventure on the River Ter. On the way there we will have the opportunity to enjoy the Catalonian countryside. At Colomers we will be met by professionals who will tell us all about our activity, which will be a kayak trip from Colomers i Vergers. We will travel through a unique landscape within a biological corridor forming part of the Natura 2000 Network, with the river flowing through a very well preserved Mediterranean riverbank woodland area of incomparable beauty. At the end of the activity we will have lunch to recover our strength, consisting of Catalonian produce. Return to Barcelona, rest and at the indicated time we depart for the Mortiz Factory where we will have the opportunity to learn about the beer making process and taste the products. Accommodation. Breakfast in the hotel. Today we will immerse ourselves in the frenetic life of the architect Antoni Gaudí through several of his most emblematic works in Barcelona. 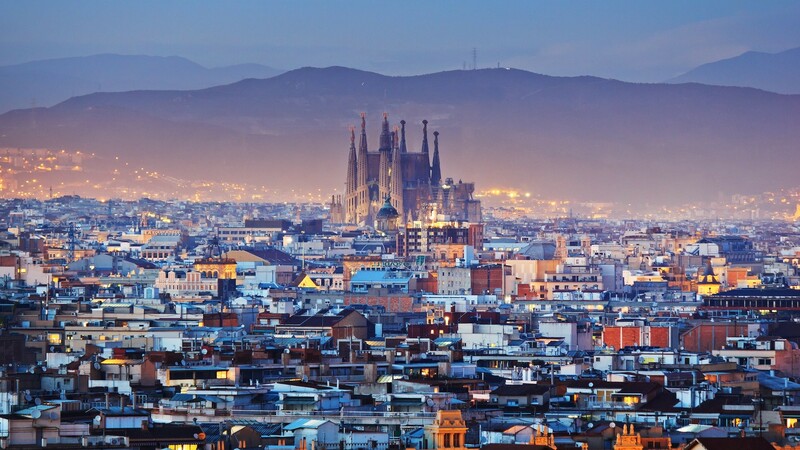 The first visit will be to Park Güell where we will take a look at the Gaudí House-Museum. From here we will take a wonderful walk through the park discovering its features. After this we will go to the famous Paseo de Gracia and visit Casa la Pedrera. Lunch. In the afternoon we will discover the latest fashion trends with our own personal shopper, visiting this wonderful avenue where so many world-famous shops can be found. Accommodation. Breakfast at the hotel. At the indicated time we depart for the Penedès region located less than 30 minutes south of Barcelona and just 15 minutes from the magnificent beaches of Sitges, in a unique rural setting characterised by its endless vineyards, dotted with rural tourist accommodation, unique heritage sites and the many wineries and wine cellars that have led to this area gaining international recognition. We will have the opportunity to visit a winery and a wine cellar, discovering two gastronomic jewels of this Catalonian province. At the winery there will be a traditional visit on the tourist train and at the Montesquius wine cellar we will have a blind tasting where we will need to use our senses. After the visits we will travel to Castellani. Accommodation. Breakfast in the hotel. At the indicated time we will depart for Segorbe. The old town of Segorbe, whose historical centre was declared Site of Cultural Interest by the Valencian Government, is well worth a visit. After this we will visit the Museum of Oil where we will discover how it is made. Lunch will be in Burriana, a city of great charm, where we will taste seafood from the Mediterranean. Afterwards we will return to Castellón. Free time. Accommodation. Breakfast at the hotel then we depart for Sagunto to discover this town from the middle ages and take a cultural tour of the city. Lunch is in a local restaurant where we will have a demonstration of how to make the gastronomic highlights of this city, torta de tomate (tomato cake) and empanadilla de verduras (vegetable pasty). Afterwards we will go to Valencia where we will check in at the hotel and then go on the "a la luna de Valencia" (under the moon of Valencia) visit. This was the term used in olden times when people were forced to sleep in the open air because they had arrived late and the gates to the city walls had been closed. Nowadays this phrase means enjoying the nightlife of the city and many areas seem not to rest all night. Numerous pubs, terraces and nightclubs fill the city and offer many ways to have fun and enjoy some free time. We will try some tapas and the local Agua de Valencia (sparkling wine and orange juice). Accommodation. Breakfast at the hotel. At the indicated time we will go on a cultural tour of Valencia discovering its cathedral, the Turia river walk, the spectacular City of Arts and Sciences and many more sights in this beautiful city that will surprise us. To continue our discovery of the city, often referred to as the "queen of rice", we will visit the central market where we can see the wide range of products used in Spanish cooking and the cuisine from the Valencian Community. Here customers can buy their own products to make their own paella (Show cooking). Accommodation. Breakfast at the hotel. At the indicated time we will depart for the province of Alicante, on our way visiting the highly picturesque inland mountain villages near Alicante. We will stop at the fortress of Guadalest where we will enjoy amazing views and visit the museum of miniatures. After the visit we will travel to Fuentes del Algar a real example of the importance of water as an ecological, economic and cultural resource. The tour consists of a 1.5 km long circuit along the River Algar (which means "cave" in Arabic) to see the landscape resulting from the karstic modelling of the limestone. We will see spectacular waterfalls, countless springs coming up through the rock, pools where people can take a refreshing swim in pure, crystalline waters, formerly considered a "bringer of health", the old dam, the imposing canal and the century-old irrigation channels still in use today. We stay in the area for a lunch of traditional dishes. After the visit we continue towards Alicante. Accommodation. Breakfast in the hotel. We depart for Elche for a tour of the city and its palm grove, declared a natural heritage site and the largest palm grove in Europe with its 200,000 palm trees. The Palm Grove was planted by the Arabs and is a historical treasure. It was declared a world heritage site in the year 2000. We take a stroll through the centre of Elche and visit its basilica of Santa María. Afterwards we will visit the fishing village of Santa Pola and its salt marshes where we can spot flamingos and other birds. Lunch in Santa Pola. At the end of the visit we will depart for the region of Murcia. Dinner in huerta de Murcia. Accommodation. Breakfast at the hotel, cultural tour of Murcia visiting its spectacular Cathedral with its fascinating history and the city’s majestic Social Club building. Lunch. In the afternoon we will enjoy an equestrian show where we can interact with the animals. Dinner and accommodation. Breakfast at the hotel and departure for the train station to catch the return train to Madrid. Free time for shopping or optional excursions. Accommodation. DAY 14 MADRID – ORIGIN. Breakfast. Transfer and departure to our city of origin. If you like our proposal we recommend that you make use of the button "request of budget" that you will find at the end of this itinerary. In Producto Propio we have a wide experience in the organization of groups. For your organization we have the best options in prices of air fares and land services. Don´t hesitate, get in touch with us and try our service.